The Quai D Orsay Imperial is a cigar for everyone! With its great taste and amazing aroma to every smoker, smoke this cigar from the beginners to the experts and enjoy the best of her. 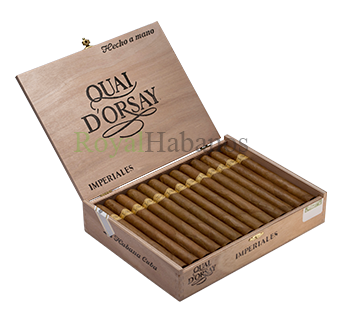 It is a perfect blend of smooth and creamy taste, so that the Quai D Orsay Imperiales easily one of the most popular cigar cigars on the market. The Quai D Orsay Imperial cigars are a great gift for everyone. This cigar is a very classic stogie in a beautiful packaging and excellent workmanship comes along. The processing of the Quai D Orsay Imperial cigar is so perfect that if you move your finger across the body of the cigar, you feel no bumps or lumps and only a flat surface.